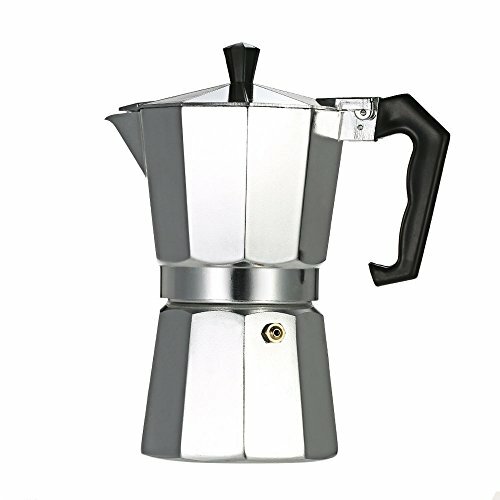 This espresso maker makes espresso making process becomes easier and enjoyable. It is used on gas or electric stovetops. Great for restaurants, serving, parties and home use. Buy and enjoy your morning or afternoon coffee time! 1. Unscrew the 3 parts of your espresso pot, fill the base with water up to the level of the safety valve and insert the filter funnel. 2. Fill the filter funnel with finely ground coffee (do not press down), make sure there's no coffee powder left on the edge, then place it back to the lower chamber and screw the top and base together firmly. 3. Heat a few minutes on the heating device with a small / medium fire, the coffee slowly overflow into the upper. 4. Take the coffee pot away from the heating device, and then you can enjoy your coffee. High quality durable cast aluminum body in the classic octagonal shape. Great for restaurants, serving, parties and home use. For use on gas or electric stovetops (not included), easy to use. Its efficient layout forces pressurized water through coffee grounds, and deposits a rich, full bodied espresso blend into the serving chamber. Ergonomic plastic handle for firm & reliable grip. If you have any questions about this product by Decdeal, contact us by completing and submitting the form below. If you are looking for a specif part number, please include it with your message.